I know you did all this years ago but i just found this post! I AM BLOWN AWAY AT HOW AMAZING THIS IS!!!!! Have you done any more boards? I would love to see more. I know you said you were working on a ninja all stars board, did that ever end up happening? Every time I come back to this thread, I think, WOW. 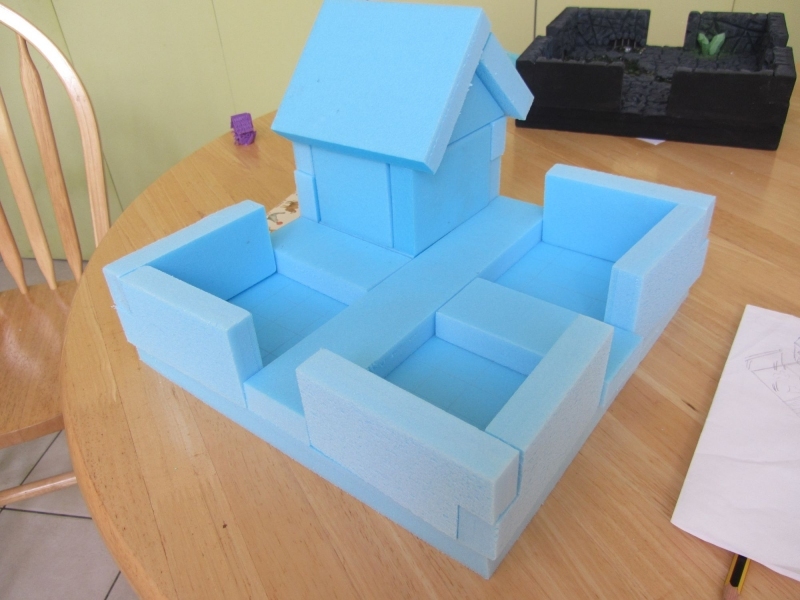 There is a lot of "How to" for foam buildings there, quite well explained. Thanks for the continued interest in these boards I haven't made any more since unfortunately as I don't have any space for more! Whenever Legends finally arrives I will definately be making some boards for the new models. 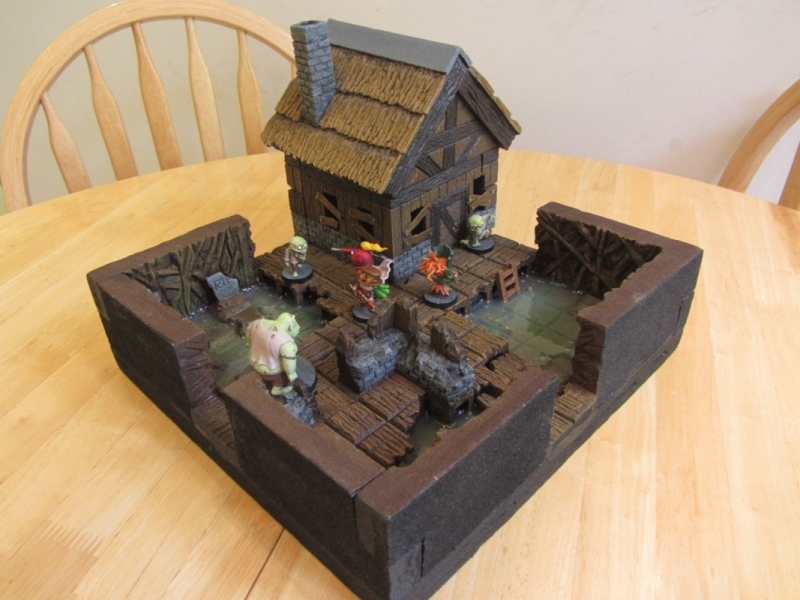 I want to make a proper dragon's cave for starfire (think the hobbit movies, gold coins and treasure all over the floor), a kobold village tile, a couple of ice cave tiles for the frostbyte ravagers and some medieval village/castle type tiles for the midnight tower / crown guard. 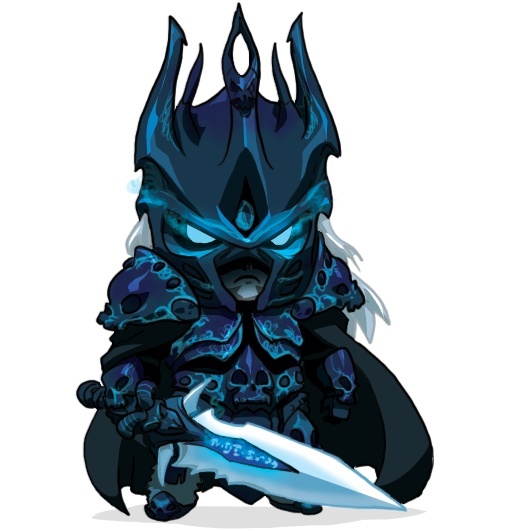 Until I have the models in hand though I don't want to pull the trigger as I remember being surprised at how different the Forgotten King models were to the original SDE base set. 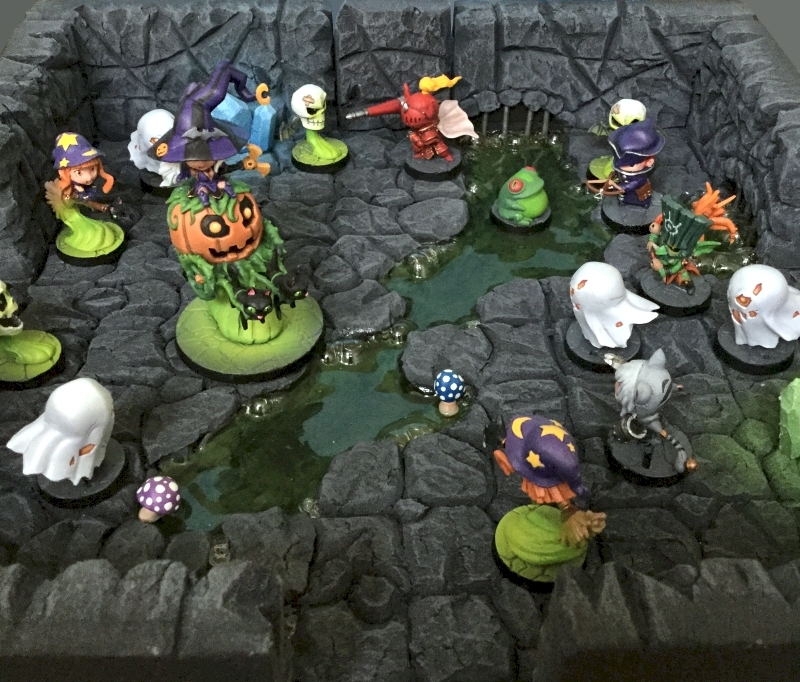 I've got the itch to make more so badly lately, I find it incredibly therapeutic, but we don't play the game as often as we used to (as we have used all the models and tiles etc a million times and are desperate for the new stuff in Legends which we backed for the everything package on). I'm still considering the possibility of making a pirate ship for Captain R (and some converted pirate skelletons I made for him out of the rattlebones creeps) but that way madness lies I've already got half the kitchen cupboards full of SDE boards and miniatures and game boxes so I don't like to push my luck! Maybe one day I will get the shed mouse proofed and store some stuff out there. Anyway... 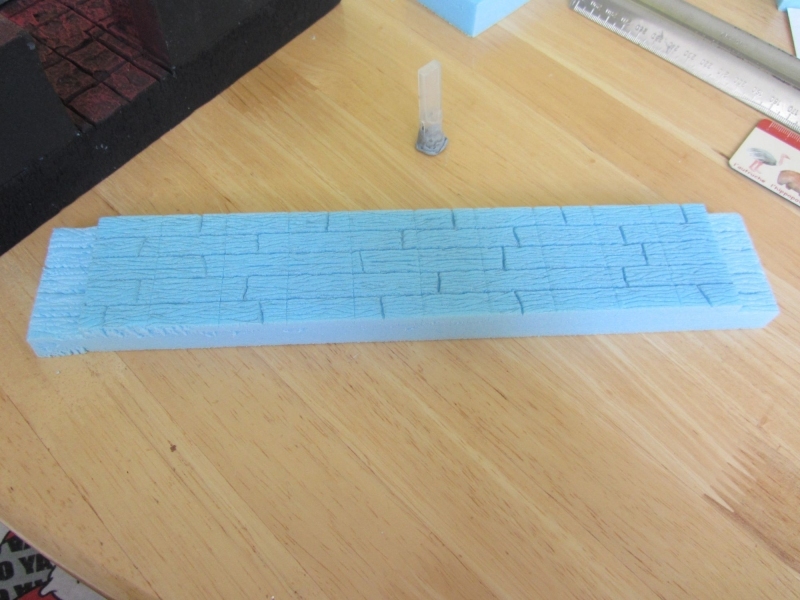 I hope Varagon doesn't mind but I thought I would post the "tutorial" that I wrote about making the Stilt Town tile for his Zine. I'm not sure if it ever went in the zine or not but I wanted to share the process since I had been a little cryptic before as I didn't want to make the zine less interesting by posting it all beforehand but it seems fairly safe to post it now? If not...I do apologise, let me know and I'll take it down! Following the release of the Forgotten King I decided I wanted to make a new board to represent Stilt Town. It is this board I will be building in this article. 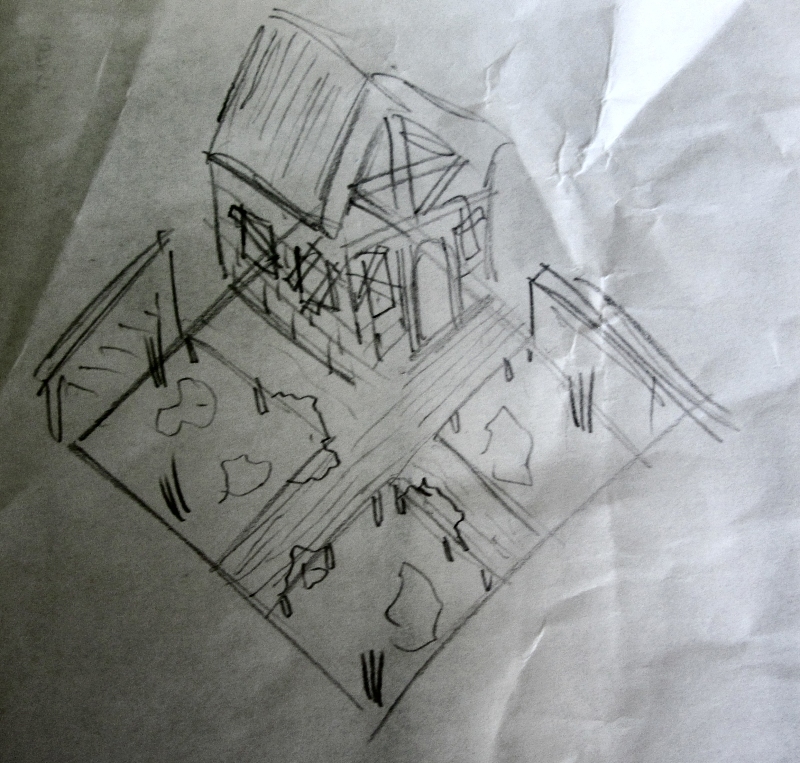 Here is a terrible sketch to show you what I was hoping to create when I started this project. 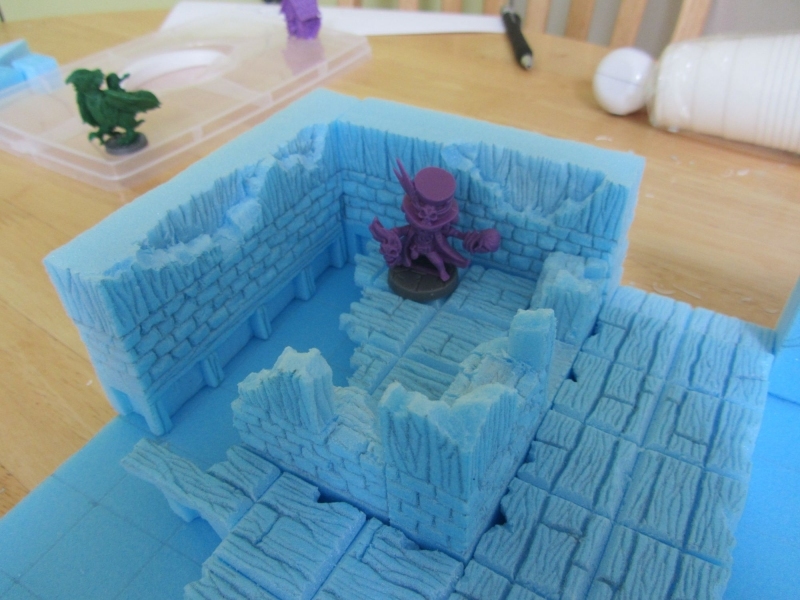 The foam I used for this project is the standard "Pink/Blue foam" that you see in so many terrain blogs. XPS stands for "Extruded Polystyrene" which is a hard, coarse type of foam as opposed to the puffy "EPS" foam (Expanded Polystyrene) that we are used to finding inside any packing box. XPS can be carved and retains it's shape rather than deforming like the EPS variety and it doesn't pull apart into little balls. I bought mine from an insulation specialist in the UK, but I'm reliably informed that it's available in most decent Home Depot stores or similar stateside. 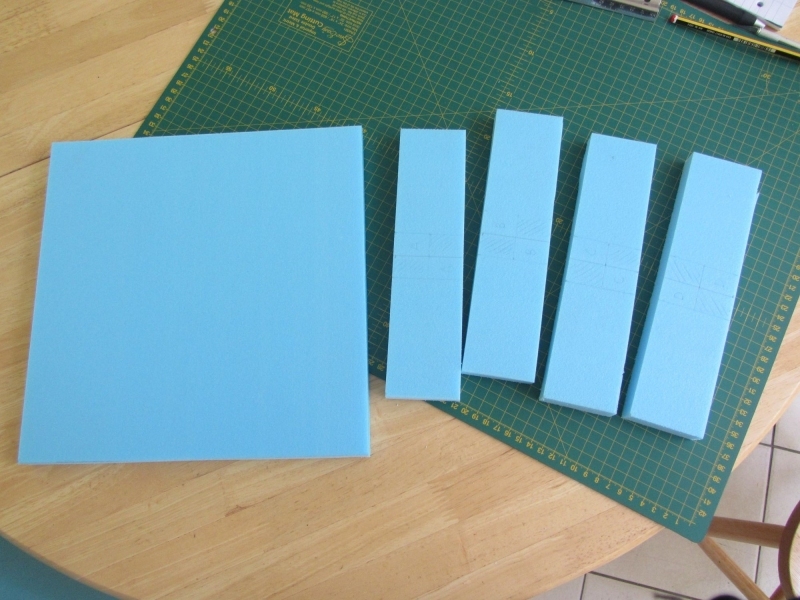 The store I bought mine from offered a variety of thicknesses ranging from 100mm to 500mm. I opted for the 200mm thickness. When I made my first batch of tiles I used 300mm for the bases for extra strength but time has shown that this wasn't necessary. 200mm is plenty strong enough. The insulation boards I ordered were 600mm x 1200mm and cost about £10 ($14). In the case of this particular tile one sheet was enough to make this board and still have about half left for my next project. 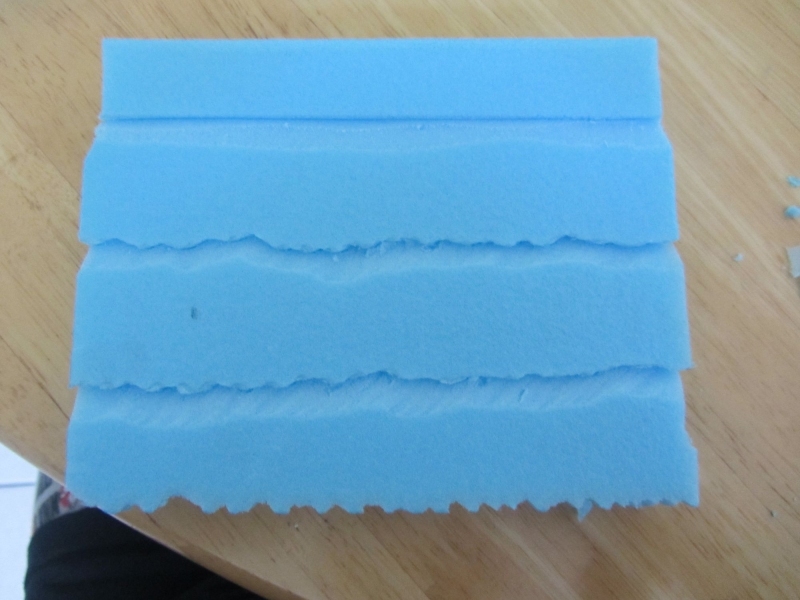 This foam can be cut with any knife you have. It pays to have a sharp blade as a dull one tends to snag and can pull little chunks out of the foam leaving you with ragged edges. I always found it best to do several shallow runs rather than trying to force the knife all the way through in one go. As I'm a huge cheapskate I don't own any fancy tools... everything I did in this project was achieved with a standard Xacto hobby knife, a Stanley Knife (A boxcutter in the USA? according to google), a regular pencil, a set sqare for the angles and a ruler for the measuring. I have no doubt your efforts would surpass mine if you had something like a miter box or similar... but I find by going slowly and carefully all my angles have been near enough to square to work for me. Try your best to keep your blade perpendicular to the board and you'll be alright in my experience given the thickness of the foam. In my experience the foam has one good side and one "soft" side. The good side is crisp and hard so takes detail really well. The soft side is very hard to work with and doesn't take any kind of detail from the pencil so it's best to make sure you keep this side on the back. 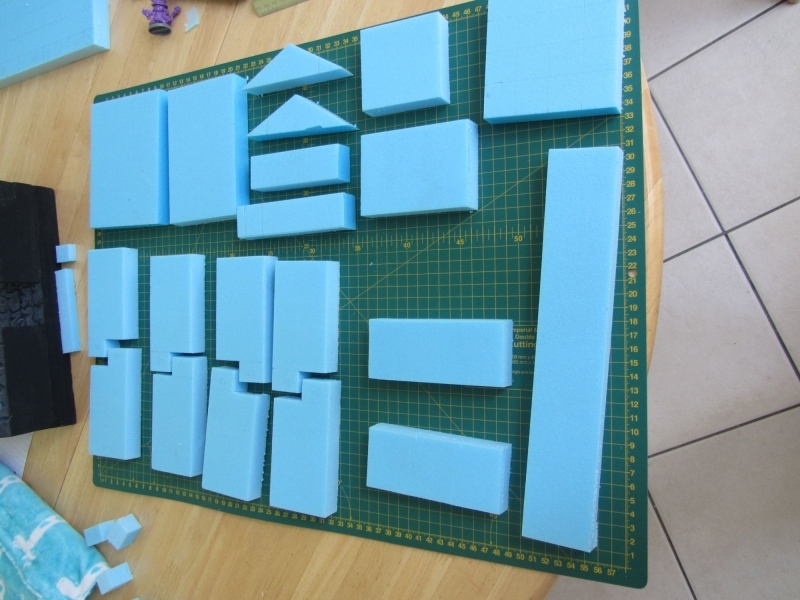 The first thing I do when I make my tiles is to cut out the base and the walls. When I first made these boards I was concerned about the stability of walls that simply butted up against each other. I experimented with a variety of different joints for the corners and in the end settled for this one. 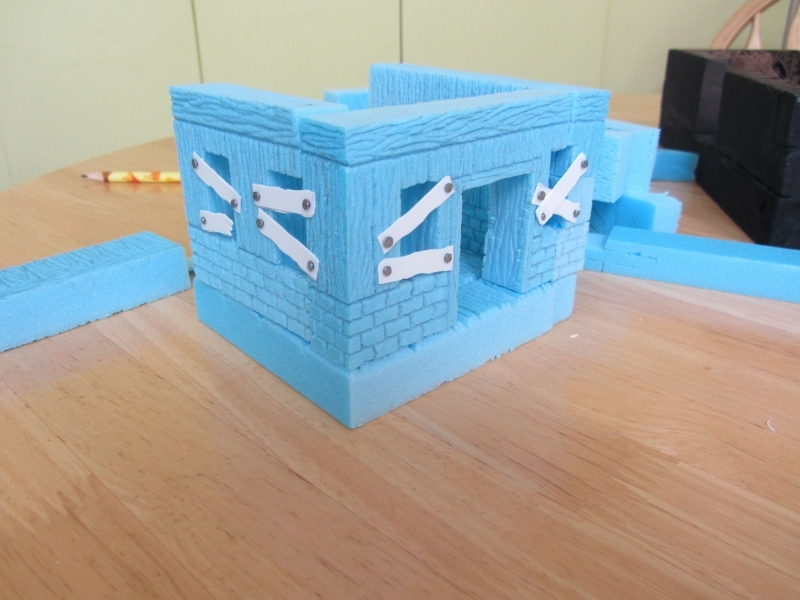 It gives a decent grip, it provides a larger surface for the glue to adhere to and certainly has stood the test of time better than some of the walls I tried using other methods. I have no idea what to call this joint but hopefully the pictures speak for themselves. 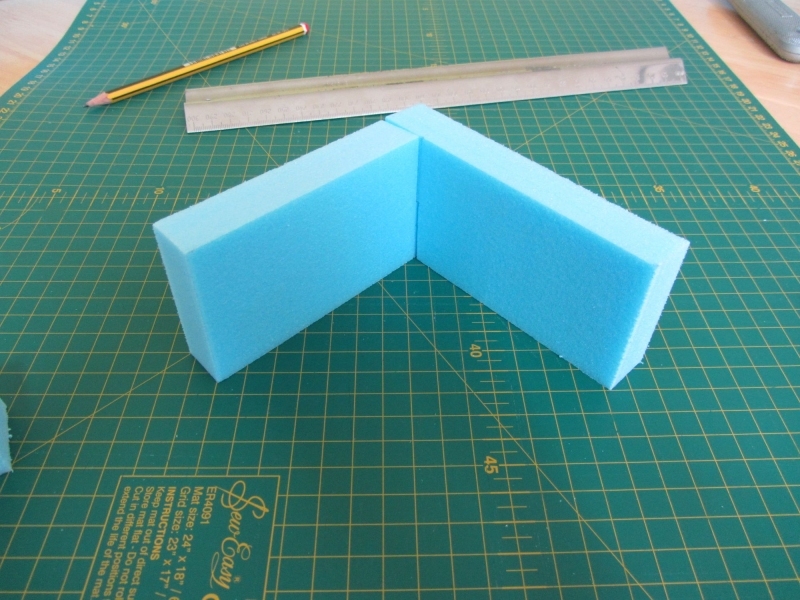 Once you've cut part of each end off they fit together snugly and make a nice tight right angle. I never start working on the details until I have all the elements blocked out. This is going to be a pretty complicated board so as you can see there are a lot of pieces. This isn't a "building a tiny house" tutorial so I won't go into detail about the angles etc. 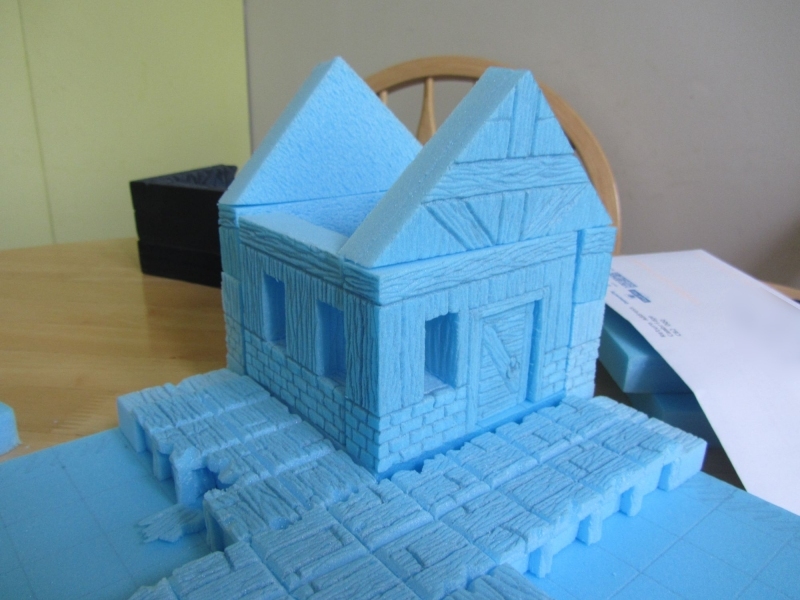 I will however explain that the reason it is made up of so many pieces is that I wanted to be able to remove the roof and rear walls to allow models to move freely inside it. If your walls are too high it can be really hard to reach the models inside. Once I was happy with the layout it was time to start working on the details. With this board I decided to get started on the wooden walkways first. The important thing to remember all the time is that your models are going to have to move around this board. 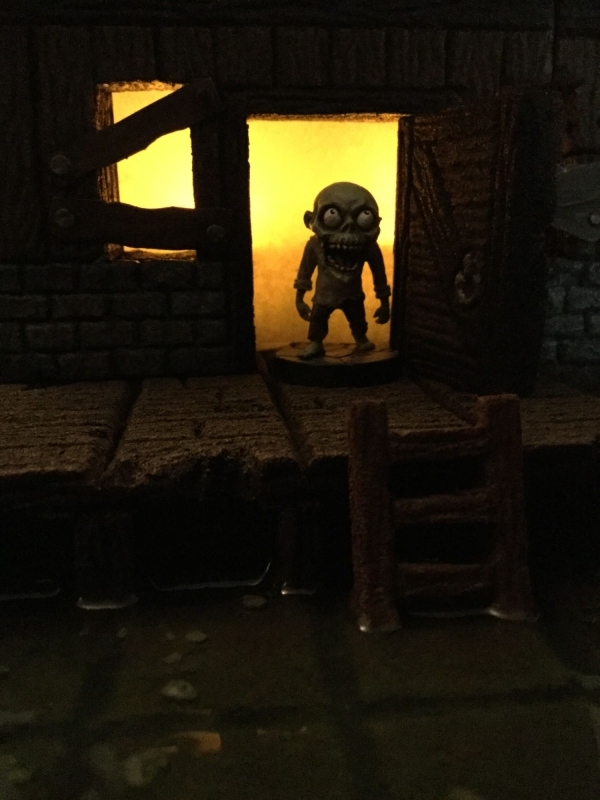 Whilst detail and character are important you have to be creating something that can be used to play a game, otherwise you're just creating a fancy diorama. With that in mind the first thing I did was to mark off the tile squares. I carved a couple of mm into the foam with my xacto knife so I wouldn't lose sight of these markings once I started applying details. At this point I switch over to my well sharpened pencil. It's a good idea to draw slowly whilst doing this as the pencil lead often catches in the grain of the foam and can veer off course if you're not careful. Here I started outlining the planks. You don't want to press too hard or you'll find it quite difficult to get paint down in those crevices without ruining your brush. Once I had all the outlines it was time to start applying the wood grain. Again this is just freehand pencil work, pressing a little more lightly than before as we aren't outlining individual planks, just going for the detail of the wood grain. When doing textures like this I find it handy to have a picture to work from. Even if it just helps you do the first couple of planks, you'd be surprised how little your brain actually knows about what wood grain looks like if you're making it up from scratch! 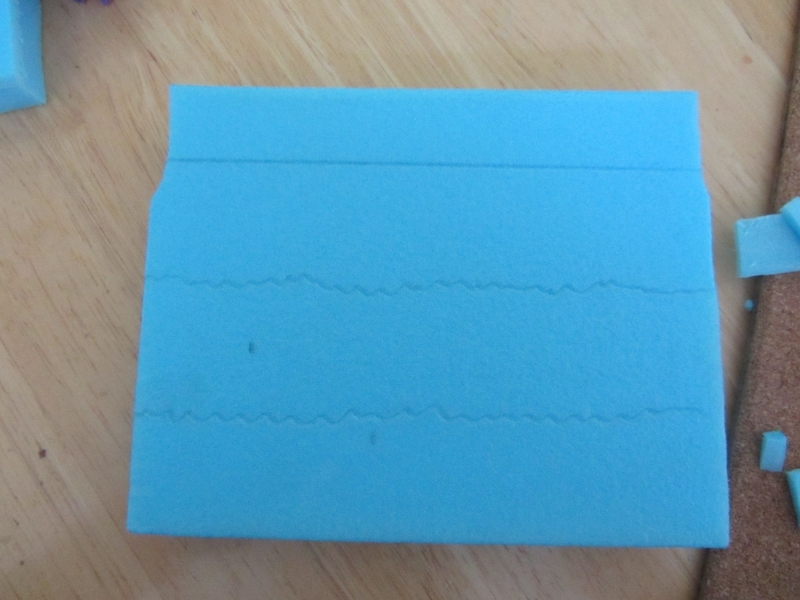 With all the details drawn on I grabbed my hobby knife again and carefully cut a V shaped channel following those cuts I made at the beginning. This allows you to retain all your detail, but also clearly marks out the grid that you're playing on. At the same time I cut a few chunks out here and there with the knife to give it a more worn out appearance, and also sliced some rectangles out from the sides to give the impression of legs. This foam is really fragile once it gets under a cm in thickness so you do have to be careful not to get carried away with details like this. If someone pushed hard on those overhanging bits of woodwork they would bend or snap. I only cut a couple of mm into the bridge for the legs. The impression of depth is all I'm going for. After this it was time to work on the house. I was using the Stilt Town spawn point as my inspiration here so I didn't have to be particularly creative. Again, once the main shape is cut out it's just a case of grabbing your pencil and going to town. You can see how by altering your drawing pressure you can create all sorts of different effects. The cracks between the stonework are much deeper than the shallow woodgrain lines. At this point you can start to see everything coming together. It's all a little wobbly until it gets glued together but you can really start to get a feel for what you're making. 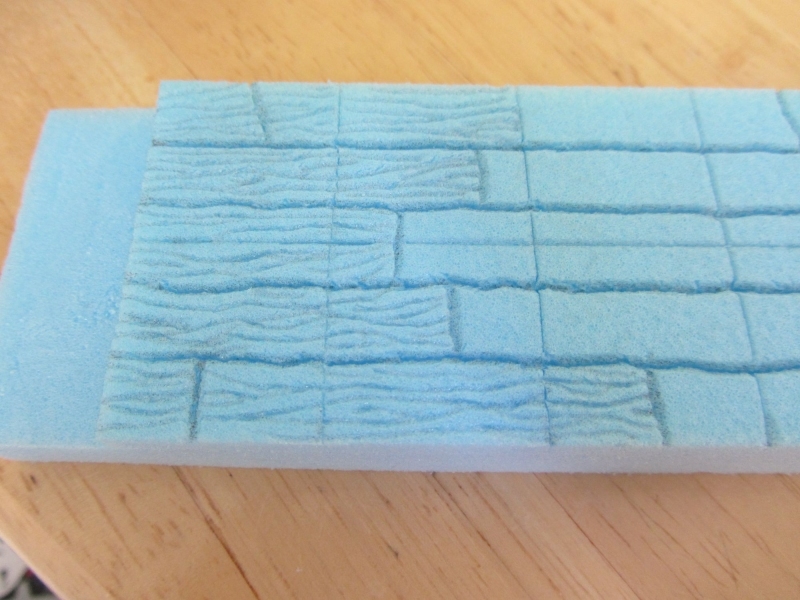 To help make the stone sections stand out and look more realistic when they are painted I grabbed a pebble from my back yard and gently rolled it against the foam. The surface of the foam crushes in and takes the texture from the stone. 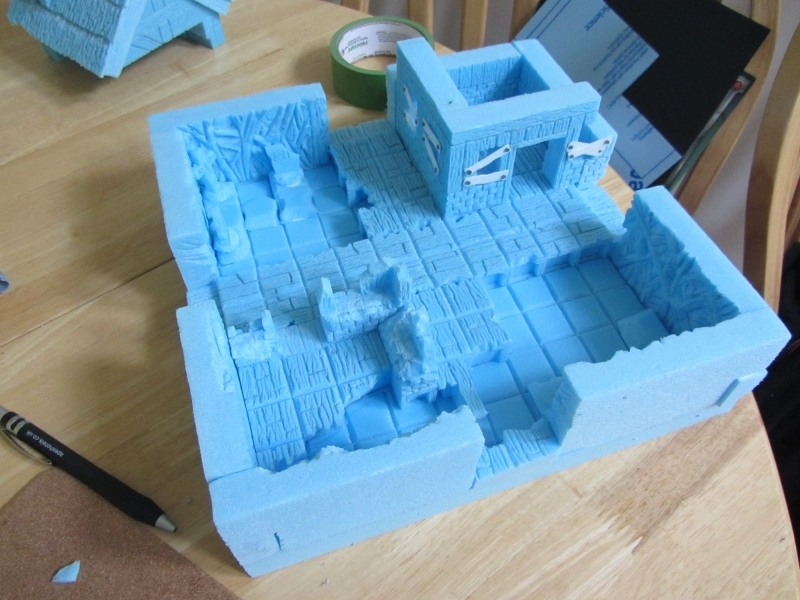 Unlike EPS foam it doesn't eventually reinflate, so you can add all sorts of textures this way. The next thing to make was the roof. 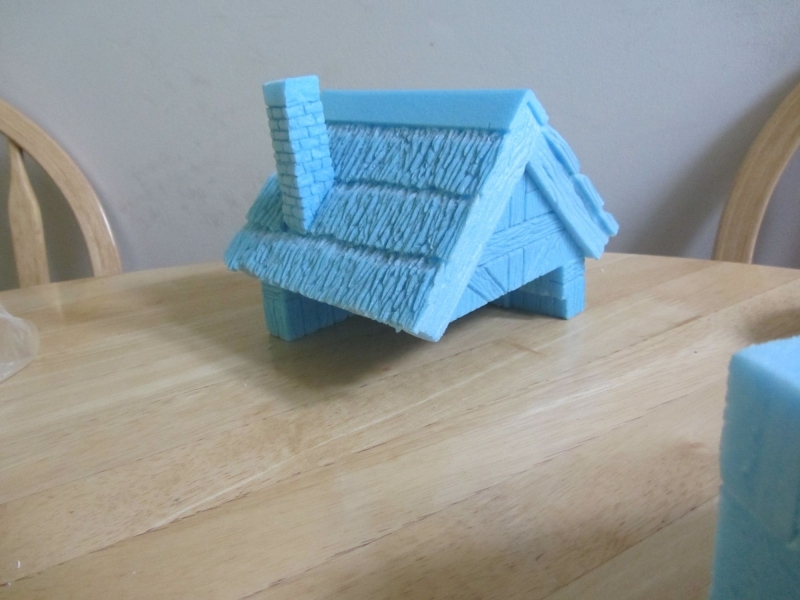 The thatched style roof stumped me for a little while until I realised an easy way to create this effect in relief on the foam. 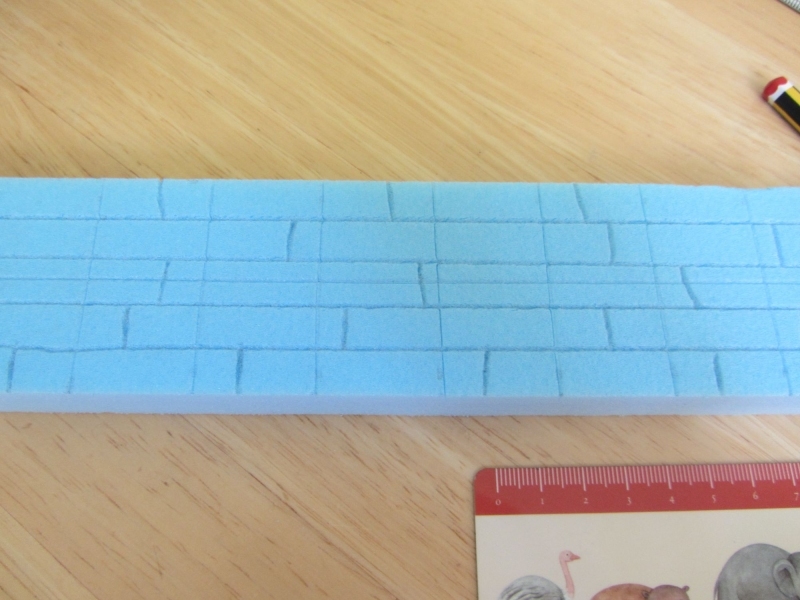 I marked out the end of each layer of thatch and cut a triangular chunk out of the foam all the way along. After this it was just a case of drawing line after line after line with my pencil until it seemed finished. 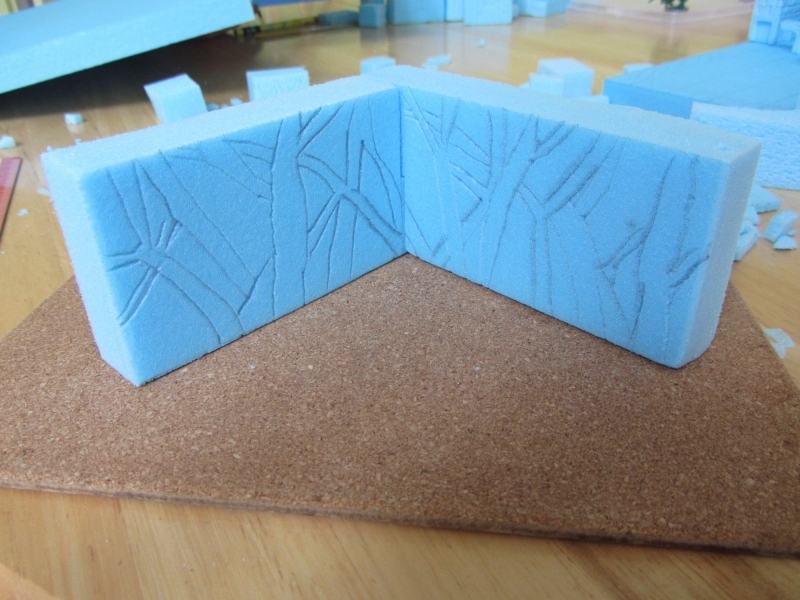 I'm sure there are dozens of ways of doing this better, but the general point of my boards has been to make everything with foam where possible so I was pretty happy with this solution. One exception to this ideal of always working with the foam was the boards over the windows. I created these using thin plasticard and some tiny model railway nails I had in my bits box. I carefully carved the wood grain into them using my hobby knife. On the opposite corner of the board is an old broken down house. This was again all created with my trusty pencil and hobby knife following the exact same process. When it came to detailing the tile walls I got my youngest son involved. I asked him to draw me some spooky looking trees and this is what he gave me which was perfect. This shows just how easy it is to draw on this stuff. Unfortunately I totally forgot to take any pictures of them whilst I was carving them out with my hobby knife because I was busy talking to my son abou it, but in the next picture you can see the exact same walls after I've gradually carved around them with more of those V shaped channels of varying depths. 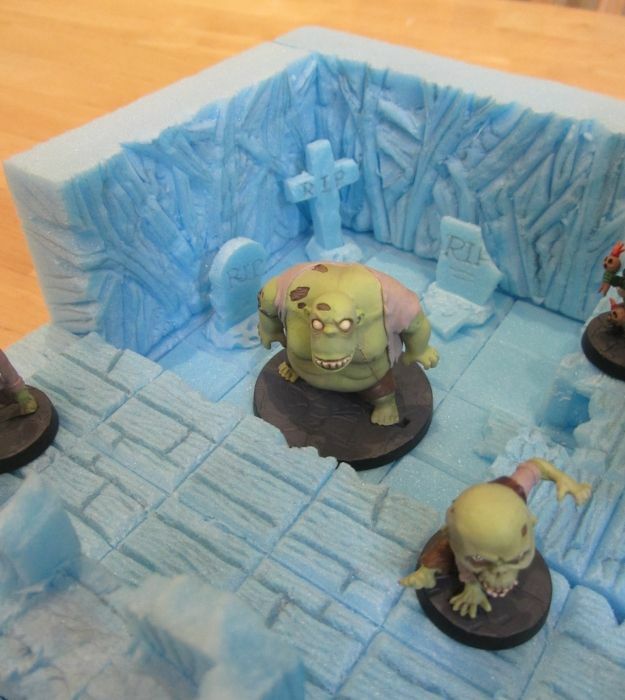 You can also see here some grave markers I made with a few offcuts of foam. These are really fragile. If anyone slammed a model into them they would break for sure but everyone in my house is careful so it works fine for me. You could just as easily use balsa wood or anything else if you were worried about stability or longevity. So with all the detail work done it was time to glue everything down and get it ready for painting. Here you can see the roof assembly after being stuck together. Then the rest of the board. I use wood glue (PVA) to glue this stuff together. I normally glue it in the morning and come back the next day and it's nicely stuck. If you try to move it after a couple of hours it usually just pops apart. I have tried using a craft variety of PVA but it just wasn't strong enough to hold together under any kind of stress. 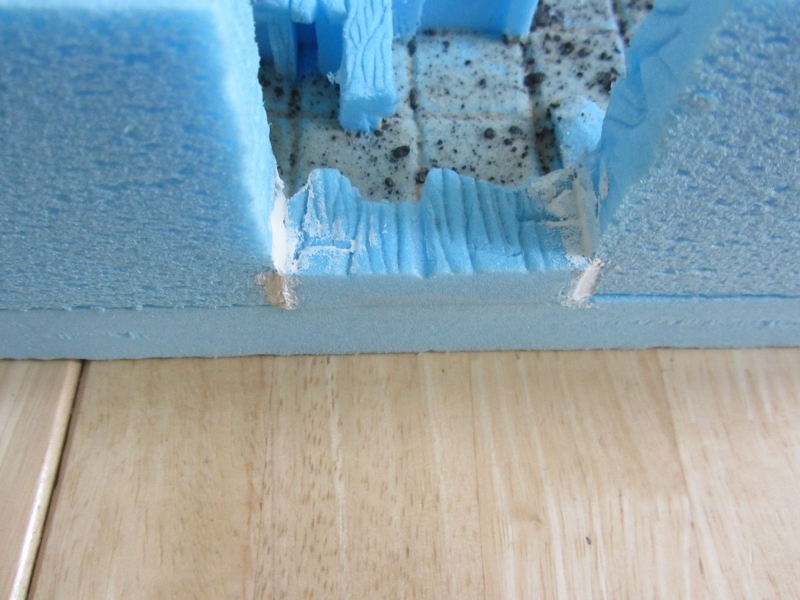 I can't speak for many other kinds of glue but you shouldn't use solvent based glues as they will melt the foam. The same goes for super glue. Once everything was nice and dry I covered the swamp base in a mixture of sand and various sizes of grit and rubble. 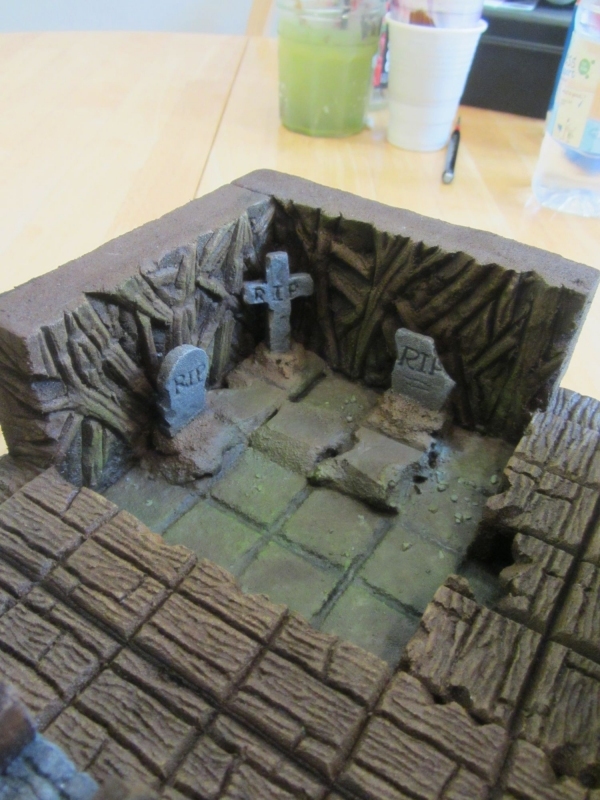 At this point I also mixed up some regular decorating plaster to plug any holes since I plan on using water effects on the swamp floor. The texture of the foam makes it pretty hard to be neat when applying the plaster but given the amount of detail I've put on the surrounding areas it really doesn't show once it's all painted. 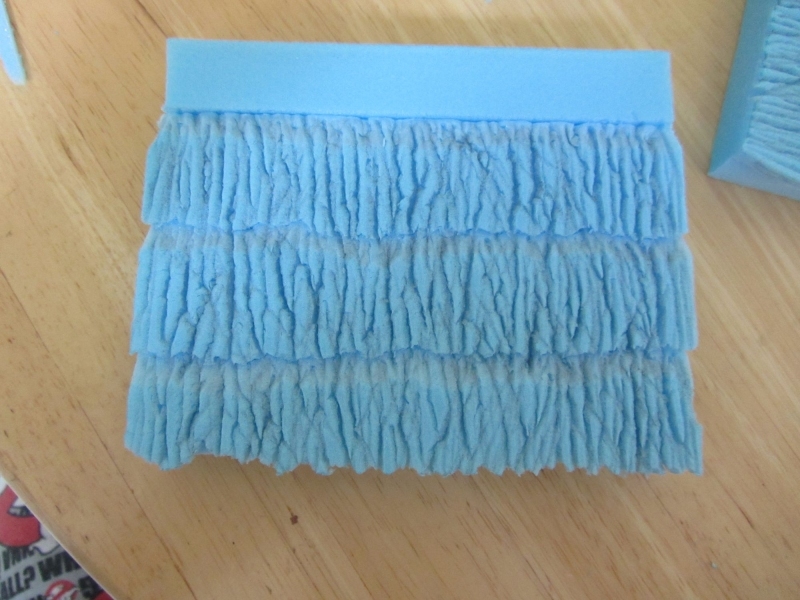 Incidentally, in the second photo you can see the "fluffy" rear side of the foam that I mentioned earlier. With everything nice and stuck down it was time to slap on some basecoats. When I paint these boards I always like to mix a good glug of PVA into my paints for this first basecoat. It helps to provide some protection to the boards surface. These boards can easily stand up to regular play without deforming, but if anyone dropped anything heavy or sharp on them it would damage them. In my experience this layer of PVA and paint helps make a kind of skin that allows the foam to shrug this off a little more easily. Once that layer had dried I started doing some simple drybrushing. I didn't want to push the highlights too far on this board as I wanted to maintain a dark and spooky atmosphere. The models themselves are bright so I figured the board itself can have a slightly subdued palette. 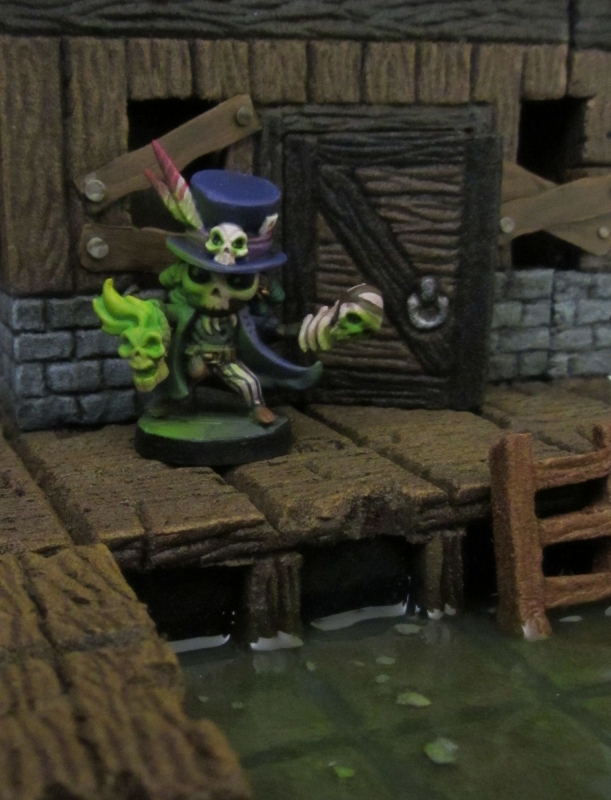 It's impossible to show it properly in a picture but once I was happy with the various shades I had layered up on the swamp floor I gave every part of the board that would be touching the water effects a double coat of acrylic varnish. 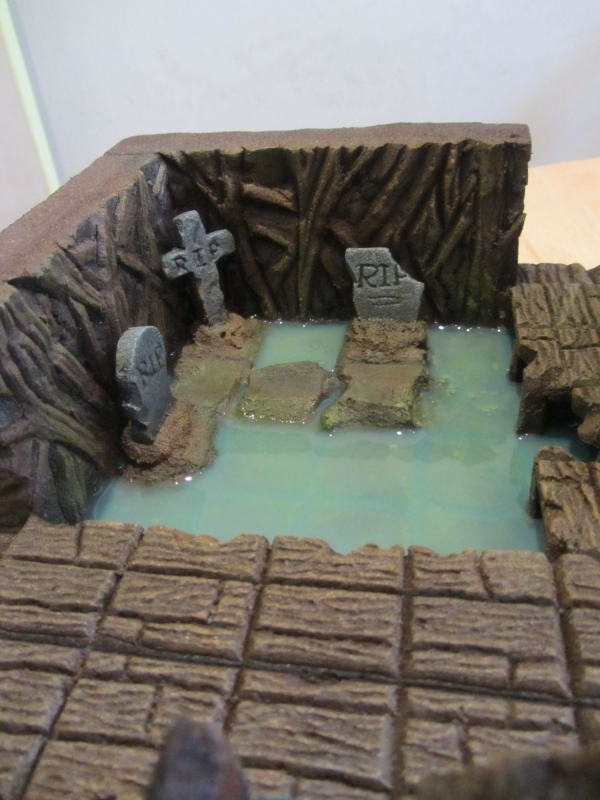 The water effects product I used was Woodland Scenics Realistic Water. I've used this stuff in the past and swear by it. It does however react badly in contact with PVA apparently, and can dry badly if mixed with inappropriate paints. The acrylic varnish layer helps to prevent contact between the water effects and any stray PVA. I can't say I've ever had an adverse reaction with this stuff and any surface I've used it on, but the instructions mention it constantly so be aware of that. 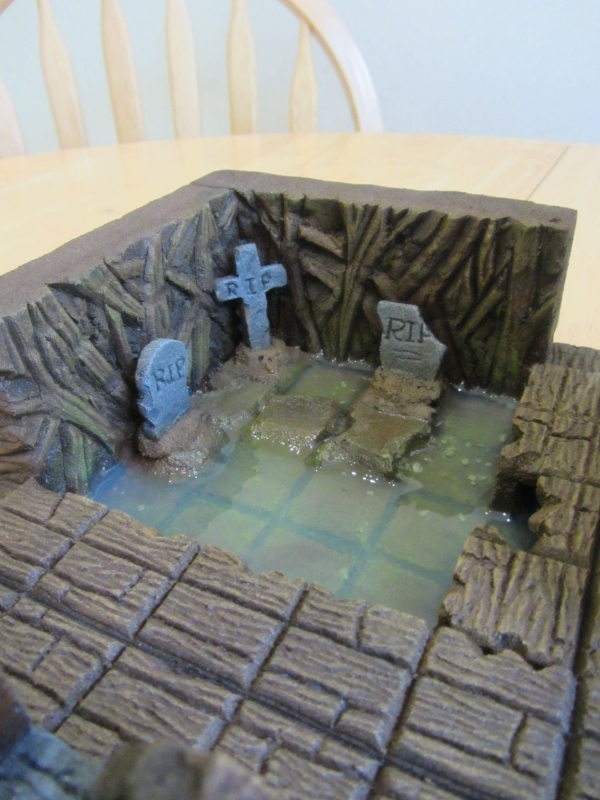 Because I wanted the swamp to look good and murky I decided to mix a little green paint in with the water effects for the first layer. 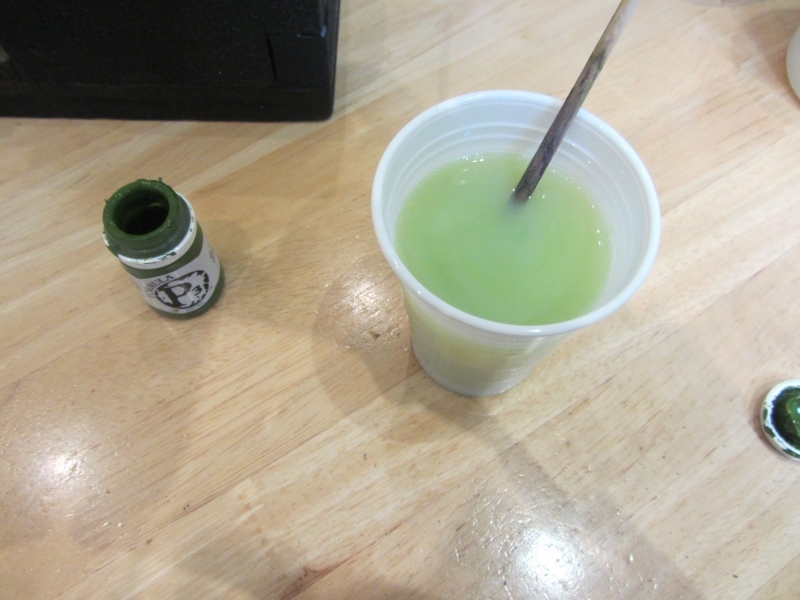 I used an olive shade of P3 paint and mixed a tiny brushful into the Realistic Water. 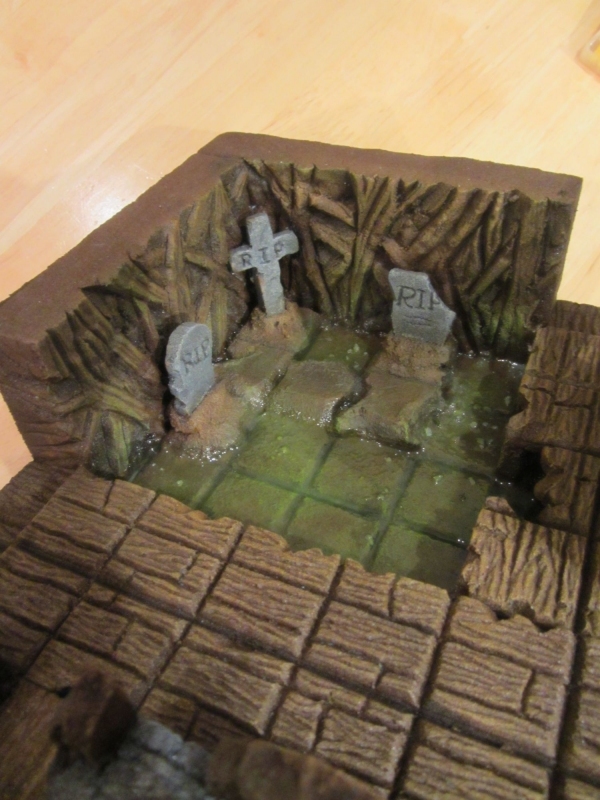 After this I slowly poured the mixture into the swamp areas of the tile and settled down for a long wait. This product is really meant to be for small puddles etc so I filled to about 1mm in depth with the first pour. After 24 hours the water looked pretty much unchanged. The next photo is after 4 days of drying time. I was really happy with the colour, but wanted more depth so decided to add a second layer. 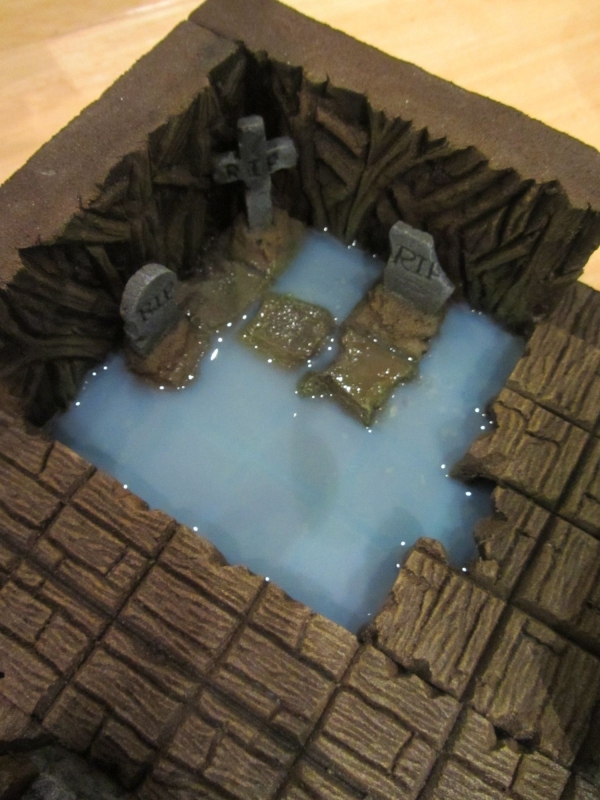 This time I added the Realistic Water without any paint added for a clear top coat. Again this coat took several days to dry. It is dry to the touch after 24 hours or so but it can take a week or two to go clear if, like me, you have been a bit overzealous with your pour. So there you have it. 2 weeks after pouring the final coat of water effects and it's clear and shiny. This stuff gives wonderful reflections and looks so lifelike. At this point I happily called the tile done. I could possibly push the painting a bit further but I really don't want it to start looking overly happy and cute. It's brighter than it looks in the pictures but I'm not the best photographer so it's hard to show it accurately. With the addition of a folded up piece of tracing paper and an LED tealight I'm able to light the house up nicely if I ever feel so inclined. I hope this answers most of the questions people had when I first posted these kind of boards online. They're a really fun project that don't take too much time at all. Given the small amount of resources needed to create them they're ideal for beginners and don't require a huge financial outlay. 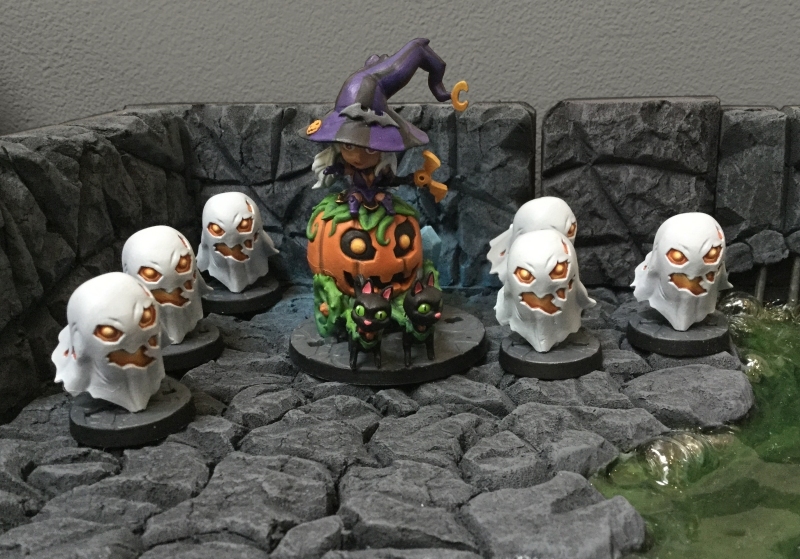 After I finished painting Beatrix I felt she didn't quite have enough "presence" to be a dungeon boss... so I made a quick magical air puff thing like the skelletons and witches have out of green stuff and elevated here a little... it made all the difference in our games and really made her stand out. Glad to have inspired you Sukausu! 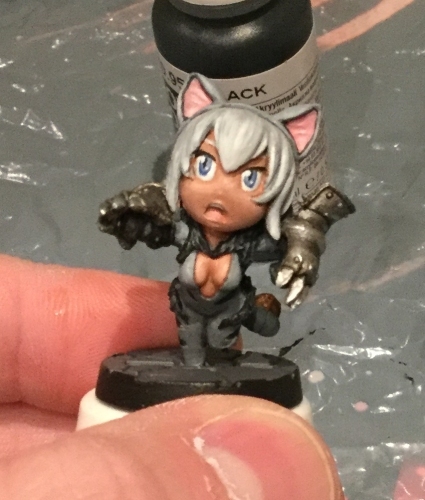 Thanks for the compliment Tat2arist The grey colour scheme on Nyan Nyan was at the request of my wife, I was pretty happy with the way it turned out, it took a lot of layers of airbrushing before I was happy with the shade. The price has gone up a little since I bought mine but the service is great. Very quick delivery, well packed, I never had any dents or crushed corners on any of the boards I bought. Im in the middle of making a bord now. Your tutorial is super helpfull. One queston how high are you edge walls? Also as im rereading all off this again and again i see you were trying to make a NAS bord but was strugling with roof tops iv got two sugestions for you. 1 use black sand paper on them as a cover it might in crease friction so they dont slip of. 2 use some match sticks to grid the squars, it thers a lip to each square it will be harder for them to slide. Hi Sukausu, glad to hear you're making a board, can't wait to see how you get on! What theme are you doing? Thanks for the suggestions! I did actually try both of those (Technically I used skateboard Griptape rather than sand paper but you know... same difference) but found that the figures were so heavy and dynamically posed that they toplled with even the slightest breeze. 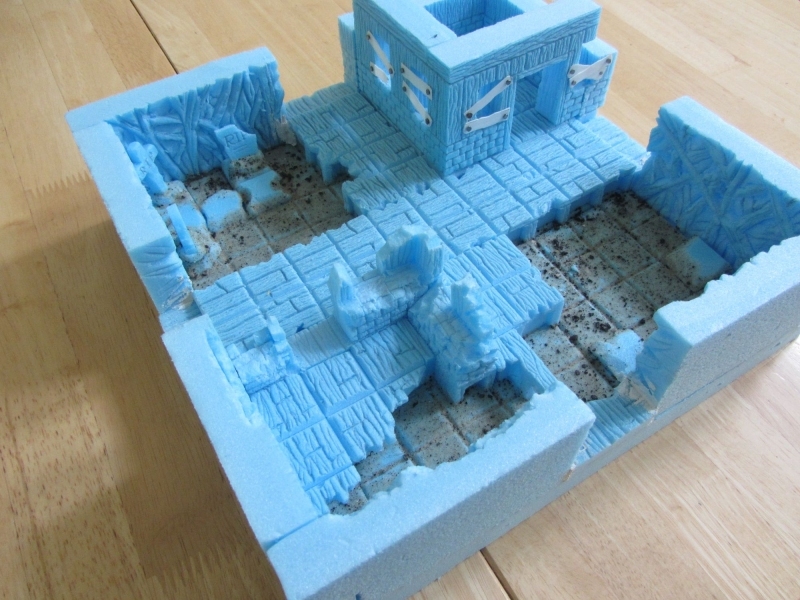 The only solution I ever found that really worked was to sink magnets into every single base and roof square and felt that it cost way too much. The main reason I never really pushed ahead is that we didn't really *GET* Nas as a game... it didn't work too great for my son and I compared to the narrative play of SDE. 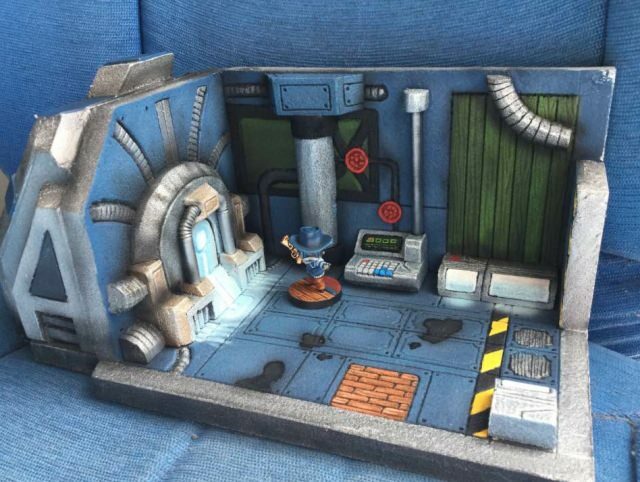 I was hoping it would be a bit like Ninja based Necromunda but alas it wasn't so! I also hadn't realised until receiving the game itself how large the NAS board is! It then dawned on me that if I made a proper honest recreation of the board then it would end up being the size of my dining table... and storing that would have been a nightmare! 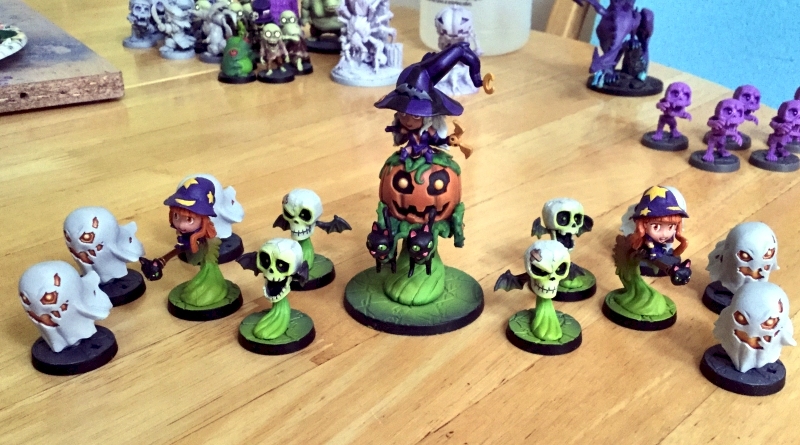 3) It is tall enough to cover all the regular minis whilst still allowing easy access with your hands to move them around. Any larger and you'd have trouble reaching into small spaces on the board. 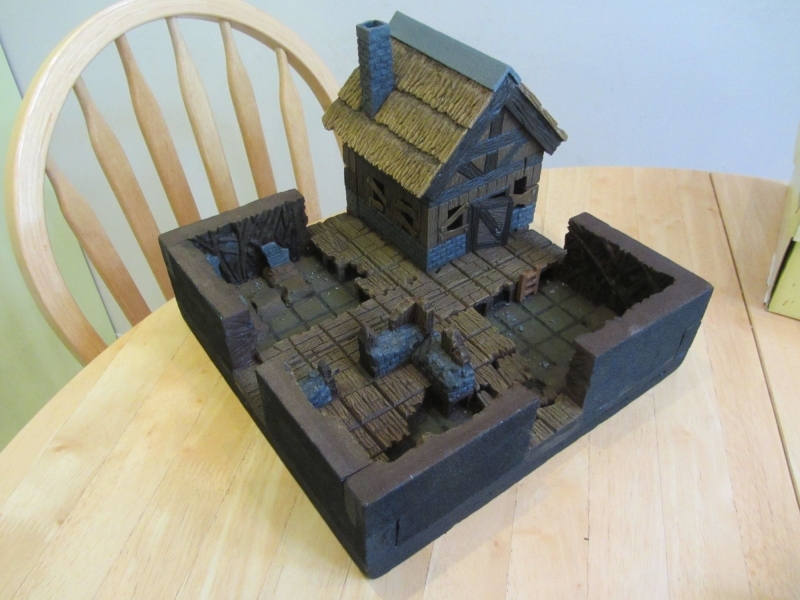 Though I was EXTREMELY pleased on how they turned out (especially sense it was my first and only time making terrain of any sort) I worry that I really don't know the first thing on what to do, to get started if I wanted to make more complicated boards for SDE. Each one of these boards (and many of the others I want to make) leave me kinda lost on where to start. For instance the first two pictures show alot of layered rocks. I am left asking how I do I do that to not only make it look right but allow it to play right, where models can still stand without falling off. The last one is so detailed with the drop off and everything that again, I am just lost. It is quite clear that you are very experienced with building things like this. Is there any tips you can give me on how to start planning this build? and I'm stealing that magical puff idea for elevating Beatrix. 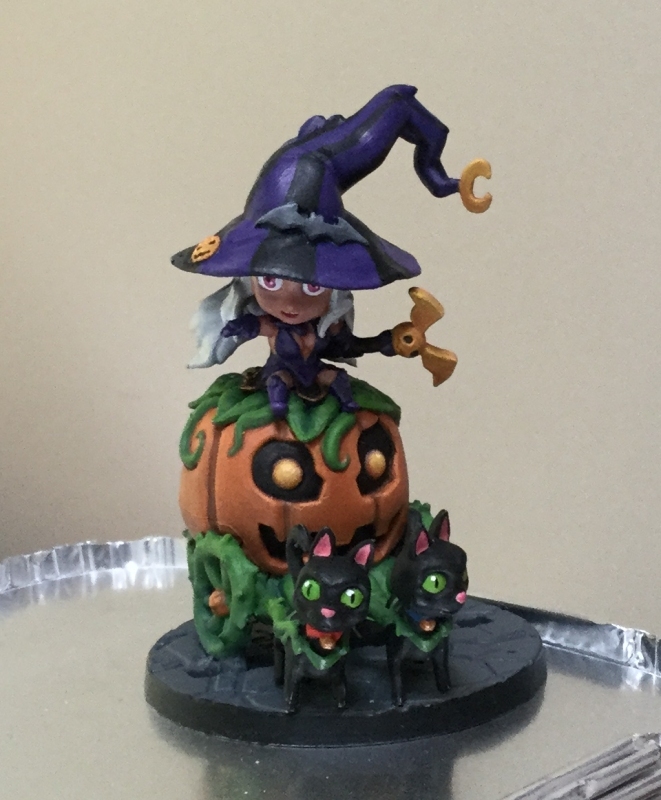 Mine is off her base by about 1cm, but only on a wooden dowel. 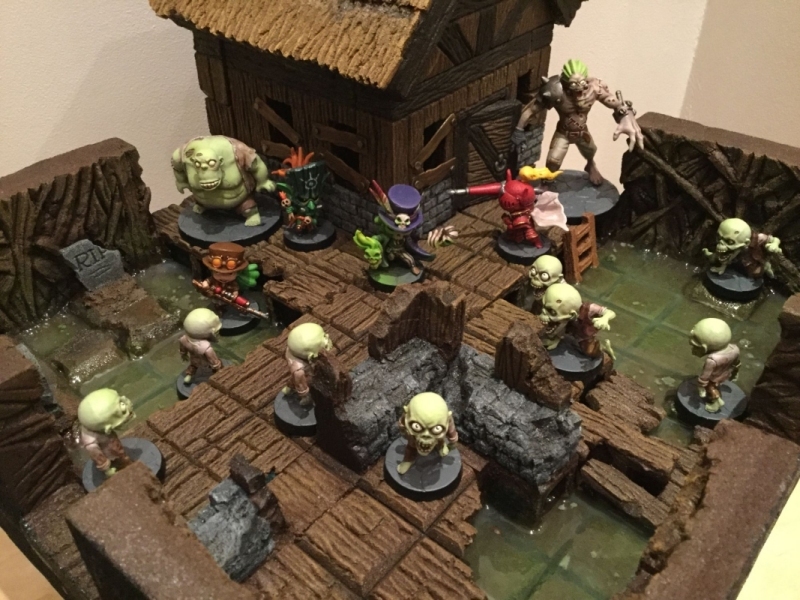 Apologies for missing these posts, I've been avoiding the forums somewhat lately in an effort to detatch myself from angst regarding the state of play with the kickstarter! I'm trying to forget that I'm due models and just enjoy what I have lol. I see whatsinthebox has only posted twice... so I won't spend ages answering this... if you're still around then please feel free to ask for more detail. 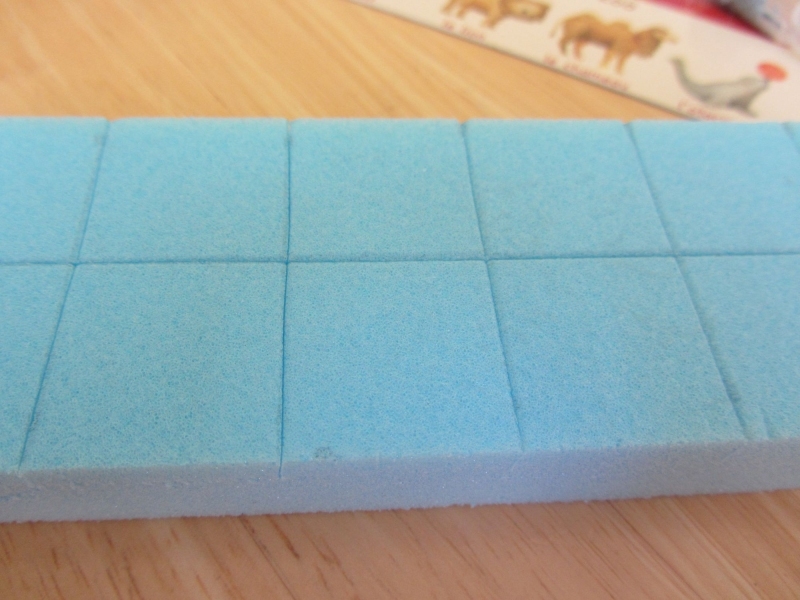 If I was going to make those kinds of tiles (knowing what I know now) I would buy 1cm XPS foam and layer them up. 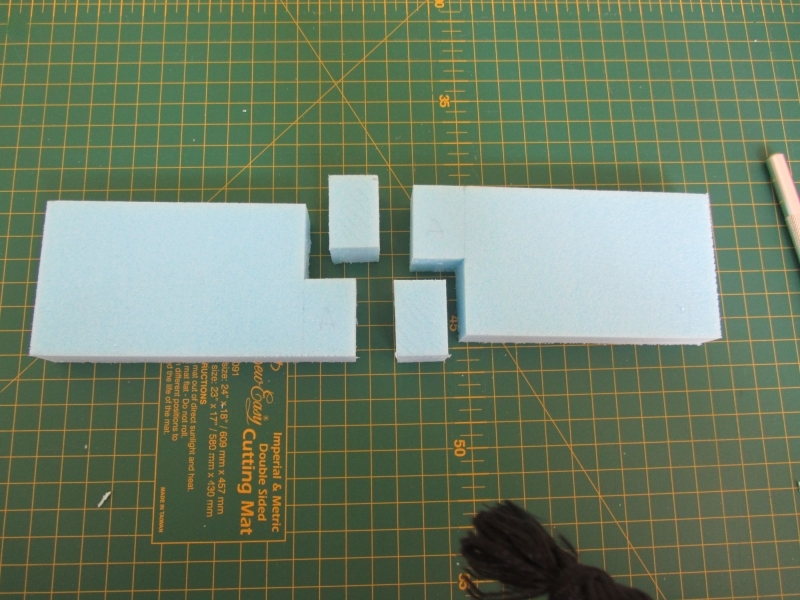 I would make a full base later, then build up layers with cutout sections for the gaps. What you have to understand though is that the boards you make will not play the same as the tiles you are emulating. On those tiles there is a two square wide border around the edge... half of which is actually (on the artwork) the side of the chasm. If you make the tile as a direct copy of the artwork then your border would only be one square wide and large base models would fall off. So you will need to either accept that your tiles won't be perfect analogs for the game tiles or you will need to adapt them to make them play the same way. 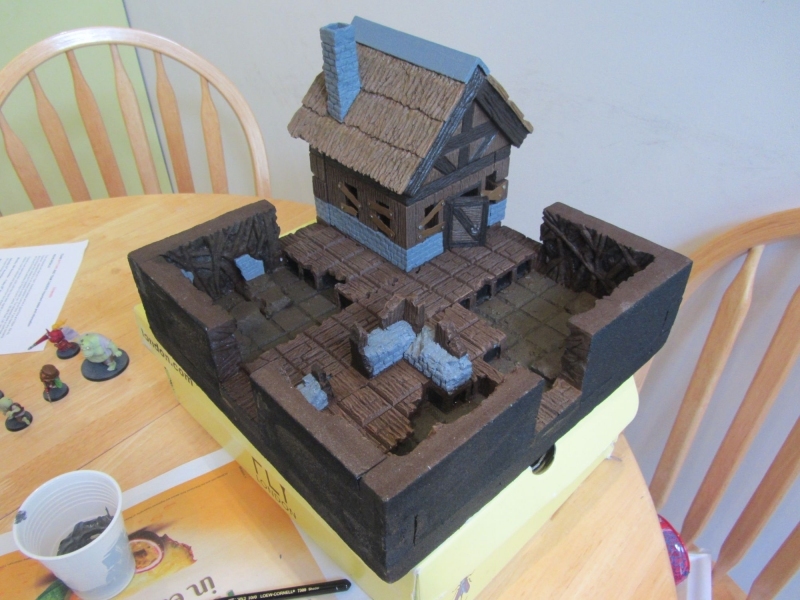 All the details in the tile such as the wooden boards, the stone steps etc... I would carve all this into the tiles in relief using an xacto and a pencil (and any other tools I have to hand that can make interesting textures etc) as described in my previous posts on this thread. Ultimately you have to balance playability with aesthetics. 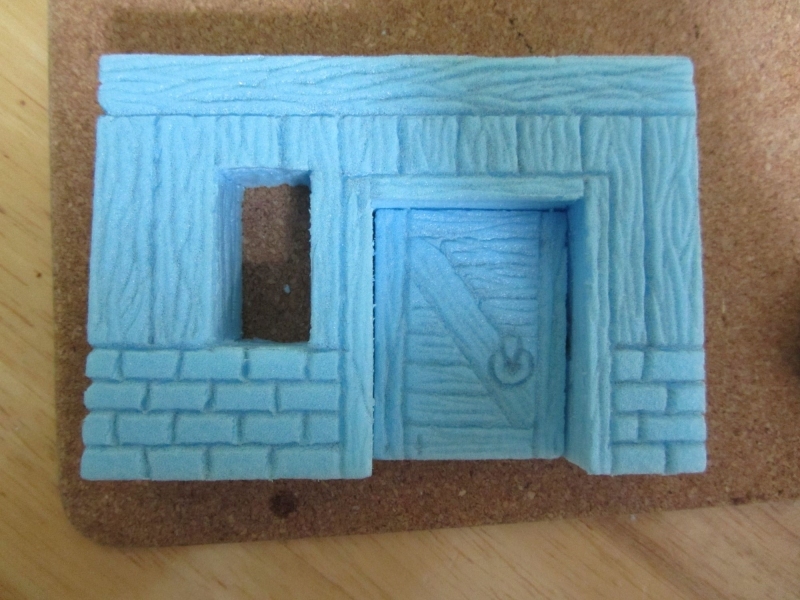 You can make beautiful stone steps in 3d and railway tracks that are raised etc... but you won't be able to stand models on them without them toppling over... this is why I choose to make most of the details on my boards (except walls and big furniture) as simple relief carvings. Salaura ... thanks nice to know I'm not the only one that looked at the model and thought "nope! She shouldn't be on the ground!" lol. On an unrelated note... I'll drop a shameless plug here... 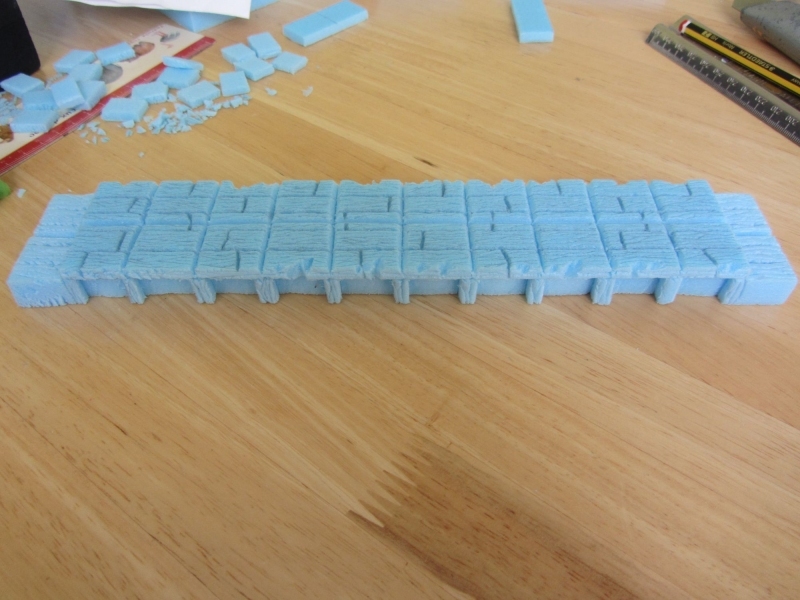 I'm working on more 3d boards, but over on the Rail Raiders section of the community, building a space train. Since I made that post, I actually check this page like every other day. Thank you for responding! I made a test tile, this is what I came up with. First off is this cart. In my opinion it looks terrible but i just can't figure out how to make it more detailed and realistic. I tried really hard to maked the wheels look round and they came out clunky. The second thing that idk if I hate it or if I just need to accept it but is this pile of rocks. The idea behind it was to be the rubble you see in some of the tiles I posted earlier but they actually look more like steps. 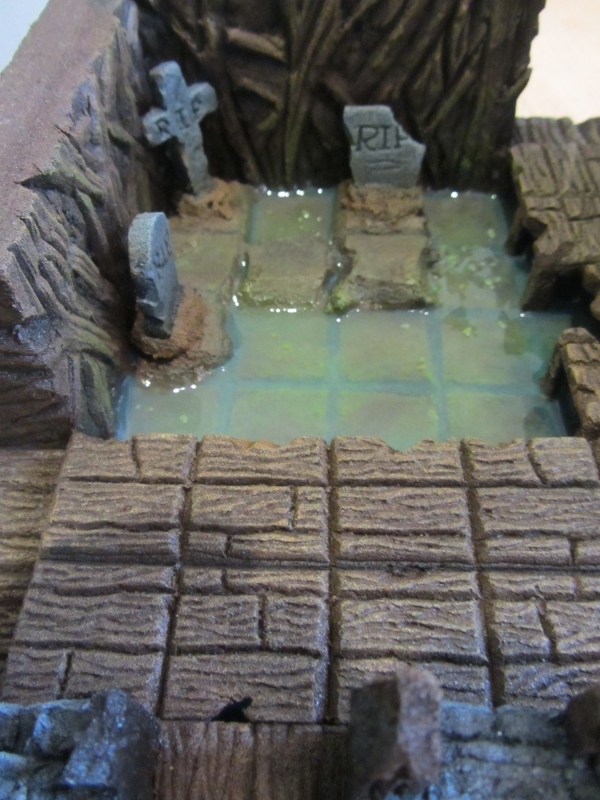 I think it is so important that my tiles are playable so made sure the rocks would be able to have minis stand on them. this, I know, took away from the realisticness of the rubble. If you have any good tips on how to fix these or any good criticisms in general, that would be greatly appreciated. OH! And when I put extra pieces on the board like the kart, boxes and even the random pick axe, would you suggest I glue them on or leave them to beable to place anywhere whenever I set up to play? Your work is amazing! I love these tiles. 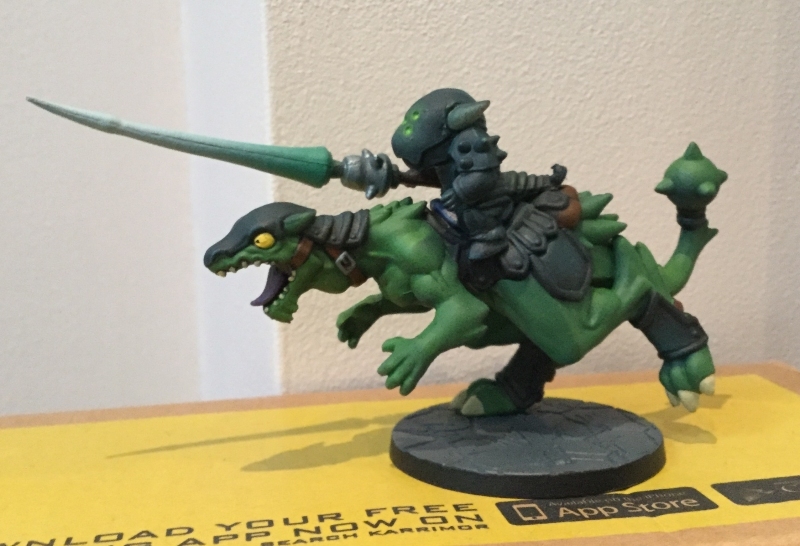 Your paint job on your minis is really clean and nice as well!